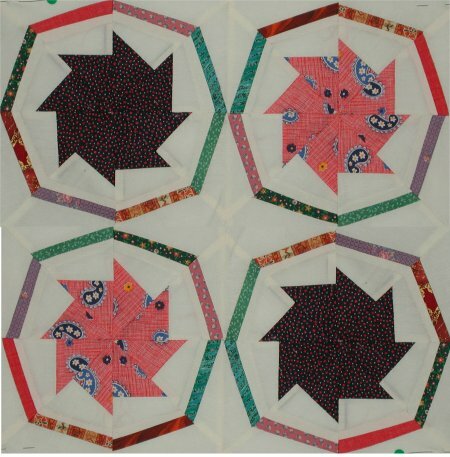 It was after the success of the quilting retreat I held at my home in California in 2002 that a number of About.com quilters near Phoenix, AZ decided to carry on the "tradition". Every February thereafter (as I write this, it is 2006), a wonderful, wonderful retreat has been held in Phoenix, hosted with great panache by the Arizona quilters (specific ladies vary but the core group is about 8 or 9). It was at the end of this February 2003's retreat that SharonAE was working on a pinwheel sort of block ... and I had been eyeballing it all weekend. BUT, I knew that I had a lot of my own UFOs to work on so that I absolutely did NOT need another one. I resisted all weekend the lure of Sharon's pinwheel .. which I have now been told is actually a Wheel of Fortune block. It wasn't the very end of the retreat that I succumbed. I made 4 blocks (shown above) and realized this would be another wonderful stash/scrap quilt.